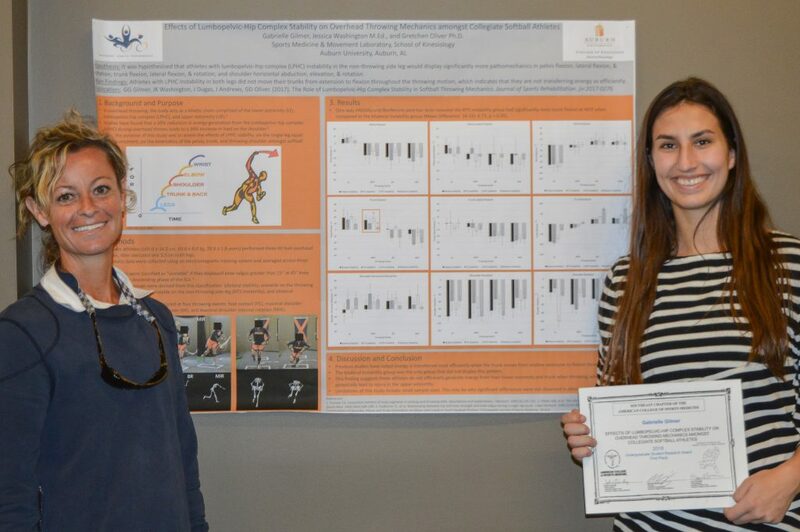 Sports Medicine and Movement Lab - Gretchen Oliver, Ph.D.
Several researchers from the School of Kinesiology’s Sports Medicine and Movement Lab recently returned from the regional South East American College of Sports Medicine (SEACSM) annual meeting. Lab researchers made ten separate presentations (1 podium, 1 award poster session, 5 poster sessions, and 3 thematic posters). This research has been accepted for publication by the Journal of Sports Rehabilitation (https://doi.org/10.1123/jsr.2017-0276). This publication has Gilmer as first author with co-authors Jeff Dugas (Andrews Sports Medicine and Orthopaedic Center, St. Vincent’s collaboration) and Dr. James Andrews (Andrews Institute for Orthopaedics and Sports Medicine), who is on the Sports Medicine and Movement Lab’s Advisory Board and also serves as a mentor to Dr. Oliver.